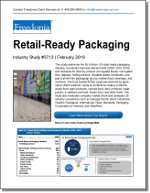 US demand for retail-ready packaging is forecast to climb 6.1% annually to $7.9 billion in 2023. Retail-ready packaging is especially important to retailers in the e-commerce age, as it simplifies stocking, reduces operating costs, and keeps shelves more organized, allowing brick and mortar stores to remain competitive with online retailers. Warehouse clubs and discount grocers use retail-ready packaging whenever possible, while other stores only use it sometimes. The customer base is expanding as chains such as ALDI and Costco open more stores. Opportunities also exist for further use in stores that already use retail-ready packaging such as mass merchandisers and home centers. Additional opportunities will stem from greater penetration in outlets that have resisted adopting retail-ready packaging, particularly higher-value outlets such as mid-level and premium grocery stores. The food market is by far the largest market for retail-ready packaging. Despite a significant level of adoption, opportunities for increased use of retail-ready packaging in the food market continue to exist, particularly for types of packaging suited for use in refrigerated cases. Additionally, high-value graphics are increasingly being sought by premium grocery stores and mass merchandisers. Opportunities for retail-ready packaging are widespread, particularly in categories such as cosmetics and toiletries, household cleaning products, office products, and pharmaceuticals. Many of these have low retail-ready packaging penetration but would be especially well-suited for it, as they are often lightweight or packaged in pouches or small folding cartons that do not stack well, making shelves messy. Additionally, retail-ready packaging is a time saving improvement over the traditional avenue of stocking these items on retail hooks or built-in displays. This Freedonia industry study analyzes the $5.8 billion US retail-ready packaging market. It presents historical demand data (2008, 2013, and 2018) and forecasts for 2023 by product (corrugated boxes, corrugated floor displays, folding cartons, reusable plastic containers, and pad and shrink film packaging) and by market (food, beverages, and nonfood). The food market further examines demand by application (fresh produce; candy and confections; bakery products; snack food; grain products; canned food; dairy products; meat, poultry, and seafood; pet food; frozen food; and other food). The study also evaluates company market share and analyzes industry competitors including International Paper and WestRock.